For tough, long-lasting industrial panel computers, select a durable industrial computer with flat panel display from Computer Dynamics. 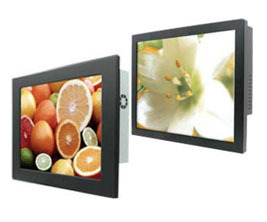 You can choose a flat panel display ranging from 8.4" through 21" integrated with a touchscreen for operator input. Our rugged industrial panel PCs are powered by Intel® -based engines, including the low power ATOM, Core™ 2 Duo, and Core-i™ processors and offer all typical PC-compatible functions. Our flat panel PCs and industrial computers are available in a variety of mechanical configurations ranging from open-frame to completely enclosed products with plastic enclosures and full agency approvals. For maximum flexibility in an industrial panel pc, select the PAC-WN systems. The PAC-WN systems are configurable to run specific applications and are the best choice when you need a large display in limited space. PAC-RPP industrial computers provide a rugged solution and are used when shock and vibration are a major concern such as on board vehicles. PAC-OPR industrial computers are better when you require a UL Certified system, up to 2 PCI slots, and an integrated DVD drive. PAC-OPR systems are available with screens ranging from 12.1” to 19” in size. Whatever your requirements, space limitations, and budget constraints Computer Dynamics can customize an industrial computer to fit your needs. We understand the need for OEMs to control component changes in their designs, and our control over the product life cycle provides that service. If you would like more information about our products, contact us today.